The premier LGBTQIA annual events in Australia's largest cities typically last two to three weeks, with Gay Mardi Gras in Sydney and Adelaide Feast Festival being the most famous of these. Melbourne's beloved Midsumma Festival, which takes place from January 20 through February 10, 2019, draws tens of thousands of participants from within metro Melbourne's sizable LGBTQIA community, from all over Australia, and, increasingly, from throughout the world. The city's Gay Business Association started the festival in 1988 to celebrate the Melbourne queer community's arts and culture. Events during Midsumma consist of a wide range of diverse programming, including films, spoken word, live music, theater, cabaret, stand-up comedy, community-group gatherings, sporting events, and visual arts exhibitions. The festival organizers categorize the many gatherings during Midsumma into Signature Events, which include Midsumma Carnival, Midsumma Pride March, and Midsumma Horizon to close out the festival. A much longer list of events billed as Midsumma Presents includes First Nations Pride, a Youth Spectacular, and an exploration of queer tech. You can get a detailed list of what's on throughout the festival by checking out the official Midsumma Melbourne festival program. 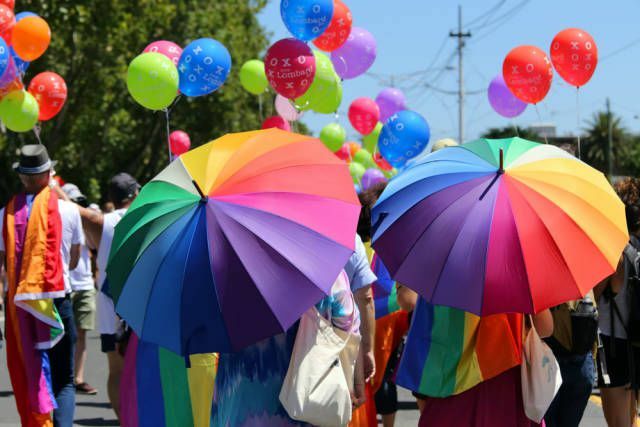 Midsumma Carnival, "billed as the most fabulous queer-day-out," kicks off the festivities with a family-friendly community day at Alexandra Gardens followed by a T Dance in the evening. The Annual Pride March Victoria on St Kilda's Fitzroy Street encourages the LGBTQIA community to "mobilise against marginalisation." The march ends with a post-pride party at Catani Gardens in the lovely bay-side community of St Kilda, one of Melbourne's most gay-popular neighborhoods. Midsumma Horizon at the State Library Victoria celebrates queer culture-makers—past, present, and future. The 2019 festival's five Hub Venues include Arts Centre Melbourne, Chapel Off Chapel, Gasworks Arts Park, Hare Hole, and La Mama. Midsumma Festival also takes over Arts Centre Melbourne Bombini Buzz for the official festival bar this year, where festival goers can enjoy special Midsumma cocktails; music by guest DJs; and talks on queer architecture, food, and history while mixing and mingling late into the evening. Tickets to most Midsumma events can be purchased over the phone or online, at the door up to an hour prior to showtime, and at a special booth during the opening carnival at Alexandra Gardens. Note that many of the free Midsumma Festival events still require tickets. The Midsumma organizers also created an increasingly popular event during the southern hemisphere's winter months, aptly named the Midwinta Festival, which takes place over two weeks from late July through early August. Events include a wide range of performances, a Midwinta Gala Ball fundraiser for Midsumma, visual arts exhibits, and much more. You can find out more about the Melbourne gay scene by consulting local LGBTQIA media such as Melbourne Community Voice, the Queer Melbourne section of TimeOut, SameSame.com's Melbourne section, and Nighttours Gay Guide to Melbourne. Also take a look at the city's excellent official tourism organization, Visit Melbourne.